Deficiency or loss of calcium and phosphorus in the bones among other minerals causes the bones to go weak. With passage of time, some people develop a bone condition where the bone mineral density (bmd) goes very low. This condition is called osteopenia and it is now a very common problem. When the bone density goes even below than what it is in osteopenia, then the person develops osteoporosis. Although it is not mandatory that whoever has osteopenia will end up with osteoporosis as well. 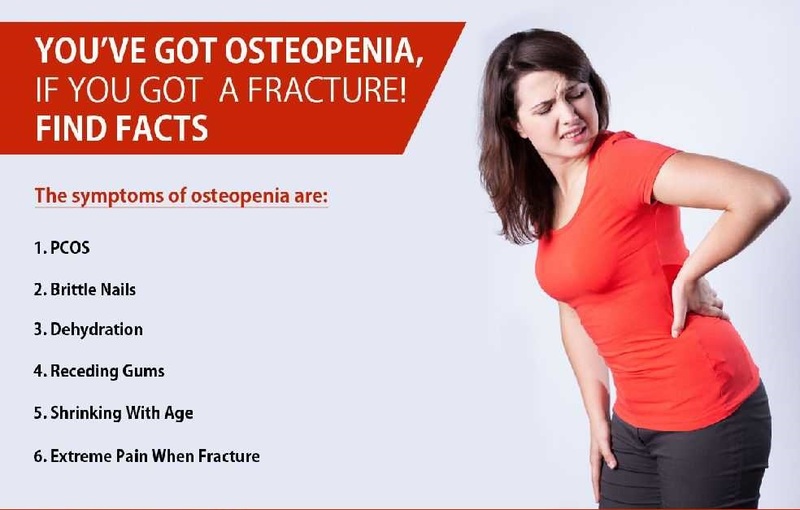 Fact is, it is very difficult to notice the signs of osteopenia. Just like osteoporosis, it could be present in your body for years, before your find out that you got the problem. Although we call all weakness of bone as osteoporosis, weakness of bone due to deficiency of calcium and vitamin d are clinically called osteomalacia. To label it as osteoporosis, bone should be weak with a normal blood calcium and vitamin d levels. 1. Extreme pain when fracture: this condition doesn’t cause any physical pain in normal life. The only time one will experience immense pain is, if there is a fracture in the bone. On the flipside, a lot of fractures occur because of osteoporosis. 2. Receding gums: this symptom is quite a surprise and one we don’t usually imagine it to be. While receding gums could be the symptom for many problems, it is one of the symptoms of osteopenia. 3. Brittle nails: if you have weak and brittle fingernails, this is a direct indication of your bone health. 4. Shrinking with age: as we age, we tend to lose height. This happens to those with vertebral fractures and poor postures. In both the conditions, this could be a symptom of osteopenia. 5. Dehydration: in some very rare cases, extreme dehydration has been a silent cause. So if you are suffering from side effects of dehydration, keep a check on your bones too. 6. Pcos: irregular periods in women is also something that could be a symptom for many irregularities, but pcos can also lead to osteopenia as are eating disorder or over exercising. Earliest symptoms of osteopenia is generalised tiredness, easy fatiguability and vague body or joint pain.